St George Mining (ASX: SGQ) has recently issued an update on its nickel sulphide drilling progress on its East Laverton property in Western Australia. Assays for the drill holes completed during Phase 1 drilling have now been received, and results confirm the favourable geology for massive nickel sulphides. Phase 1 drilling focused on the testing of electromagnetic conductors identified by consultants Newexco on a short segment of the Stella Range ultramafic belt where disseminated and veinlet nickel sulphides were previously intersected. These holes, drilled by BHP Billiton Nickel West and SGQ in 2012, are evidence of the fertile nature of channel flow komatiites in the Stella Range belt, and their capacity to host nickel sulphide mineralisation. Using data from moving and fixed loop electromagnetic surveys, conductors tested by the Phase 1 drilling were modelled as massive nickel sulphide targets situated on ultramafic contacts of channel flow komatiites. Importantly, the vast majority of completed drill holes intersected the massive sulphide targets in their expected position on the contacts of channel flow komatiites. The strong coincidence with the channel flow facies komatiites, presence of magmatic platinum group sulphides, and the concentration of massive sulphides are all indicative of a favourable geological environment for nickel mineralisation. Laboratory assays have now confirmed that the sulphides intersected at the electromagnetic conductors are secondary in nature, which can be the result of major structural deformation and fluid alteration events which follow the formation of nickel sulphide deposits. In these situations, the original nickel sulphides can be remobilised and may be concentrated in favourable structural zones, such as fold hinges. The Redross nickel deposit in Kambalda is an example where nickel sulphides were remobilised into a fold hinge with an associated increase in grade. The Flying Fox and Spotted Quoll nickel deposits at Forrestania are also examples of remobilised nickel sulphide mineralisation which have formed discrete nickel sulphide deposits. The ultramafic belts at the East Laverton Property have major fold closures and other structurally favourable sites where nickel sulphide deposits may have formed. These sites are being assessed, and are expected to generate follow‐up drill targets for Phase 2 drilling due to commence in October. Detailed lithogeochemical analysis of assay results is also ongoing and will assist in the generation of additional follow‐up exploration at the nickel sulphide prospects. 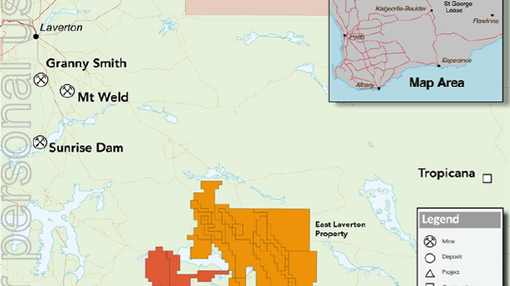 “Drilling results continue to show that East Laverton has thick sequences of high magnesium komatiites in a sulphide‐rich environment, which is geologically very similar to the Agnew Wiluna belt. We are in the right place geologically and have a large pipeline of prospects. Some of these have been drilled and warrant immediate follow‐up exploration, while other prospects are still to be tested. Results from Phase 1 drilling have provided greater understanding of the geology at East Laverton and allowed rapid exploration targeting for nickel sulphide mineralisation. A number of new nickel sulphide drill targets are being generated to add to the strong pipeline of prospects over the three ultramafic belts covering SGQ’s large tenement package. Follow‐up exploration is also being planned for prospects where nickel sulphides have already been successfully identified by drilling, and a further update on new high priority prospects and Phase 2 drilling is expected shortly. Assay results for drilling at conductor Dragon 2 have confirmed an interval of anomalous zinc and copper sulphide mineralisation, which could be secondary remobilisation of nickel sulphides or base metals in massive sulphide form. The zinc‐rich mineralisation and associated geochemistry suggest that recent drill hole DDD011 intersected an area typical of a marginal facies in a VMS system. Importantly, the Dragon 2 conductor is part of a substantial, complex, conductive bedrock source that extends into the adjacent Dragon 3 conductor, which has yet to be drilled. An intersection of gold mineralisation on the Stella Range belt was also made. Gold exploration in the Stella Range is at an early stage, and this represents the most significant primary gold intersection to date. Although the gold interval is relatively low grade, it is considered significant because it is located within a favourable structural setting. Zones of extensive hydrothermal alteration, typical for well‐endowed gold fields, were identified in drilling further to the north of the belt. The gold interval is open along strike and beneath a prominent gold soil geochemical anomaly identified in 2011. The regional moving loop electromagnetic survey at the East Laverton Property has recommenced, with the Athena and Cambridge North nickel prospects the first areas to be surveyed. The survey will then move to the unexplored eastern flank of the Desert Dragon North and Aphrodite nickel prospects, located at the southern end of the Stella Range belt. Conductors have already been identified in preliminary field data and are awaiting further modelling to refine their geometry.